TamoGraph can perform spectrum analysis simultaneously with passive surveys by interfacing with Wi-Spy, a USB-based spectrum analyzer. Wi-Spy can be purchased from TamoSoft or from MetaGeek. Note that TamoGraph DOES NOT support the oldest Wi-Spy model (“Wi-Spy original” with a green logo) or 900x models. 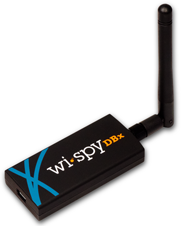 When a dual-band model, Wi-Spy DBx, is used, it continuously sweeps both bands, one after the other. Using two Wi-Spy DBx units simultaneously might improve data quality, as TamoGraph would dedicate each of the units to one band only.